Do you want to turn your painting into a stunning piece of artwork or wall mural? Or are you in search of a company that can offer you the services of the best canvas print artists? You will definitely find a solution with Superchrome - the leader in digital printing. We provide end-to-end solution for all your canvas printing needs. From the time of inception, we have been successful in delivering quality driven printing services to clients all over the world. While working with Superchrome, you will definitely be able to give your artwork the complete look and feel of real art. Being a professional full service provider, you can rely on us for all your printing needs. We have a team of canvas print artists, who can work on your requirements and specification. At Superchrome, we deal with painting in different kinds of medium. Most innovative printing technologies are used to print your artwork retaining its original look. 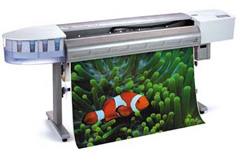 Pigmented water and UV resistant inks are used to print your paintings. Thus, the printing will stay without fading and damage for a long time. You can get your artwork printed on the choicest of canvas materials. We generally work on water resistant canvas, fast dry matte canvas, fast dry glossy canvas, and coated cotton canvas. The size and shape of the canvas is no constraint to us. We can work on canvas varying in size from A2 to 60x40". If you have any specific requirement, please feel free to suggest your preferred option. To meet your specific needs in artist?? ?s canvas prints, we can provide customized printing solutions. To give your painting the perfect look, we will stretch and mount your painting on hardwood frames. We also provide painting with gallery wrapped finish. Thus, you get the option to choose the finish you want to give your artwork. If you want to give your painting a professional touch, talk to our highly experienced canvas print artists. Our client portfolio includes museums, galleries, marketing agencies, architects, designers, consultancies, major retail groups, trade show organisers and many more. For detailed information about our completed projects, please checkout our website. To get your artwork printed, you have to just upload your painting to us. Place the order to get your artwork printed today, and enjoy our unsurpassed printing services. To know more about our services contact our customer support representatives today itself. If you would like to know more about our canvas print artist, any of the projects shown or if you want to discuss any project you have coming up then contact us 020 7237 9333 or fax 020 7237 9444 or email sales@superchrome.co.uk. Our experienced personnel would be able to guide you appropriately.